The lorne you've been longing for. A meal to relish. Perthshire findony farm. UK beef. A hugely popular Scottish favourite, our Premium Steak Lorne Sausages is made from high quality cuts of beef mixed with our own blend of spices and seasoning. The perfect square slice. 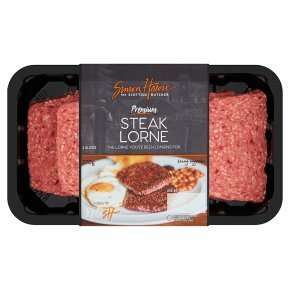 Share the flavour If you enjoy Simon Howie Premium Steak Lorne you might also have a soft spot for our Unsmoked Back Bacon. Next time you're strolling down the aisle, pick up a pack. You won't regret it. Always ensure that the centre of the Lorne is piping hot before serving.All appliances may vary, these are guidelines only. Heat 1-2 tablespoons of cooking oil in a pan to medium heat. Remove the Lorne from the pack, place in the pan and cook for 7-9 minutes, turning frequently. Lower the heat if required while cooking. Preheat grill to moderate heat. Place Lorne slices onto a suitable tray and place under the grill. (Do not place directly under the heat source, allow approx. 10cm space). Grill for 8-10 minutes, turning occasionally.